Our 100,000 sq.ft. (and growing) facility houses a department for every project need. 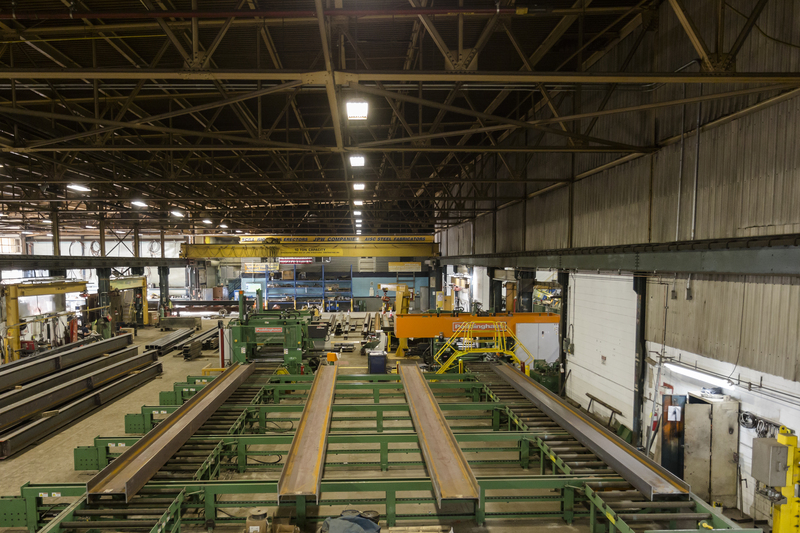 We have separate fabrication, structural steel and machining bays, two paint bays (currently undergoing a 14,000 sq. 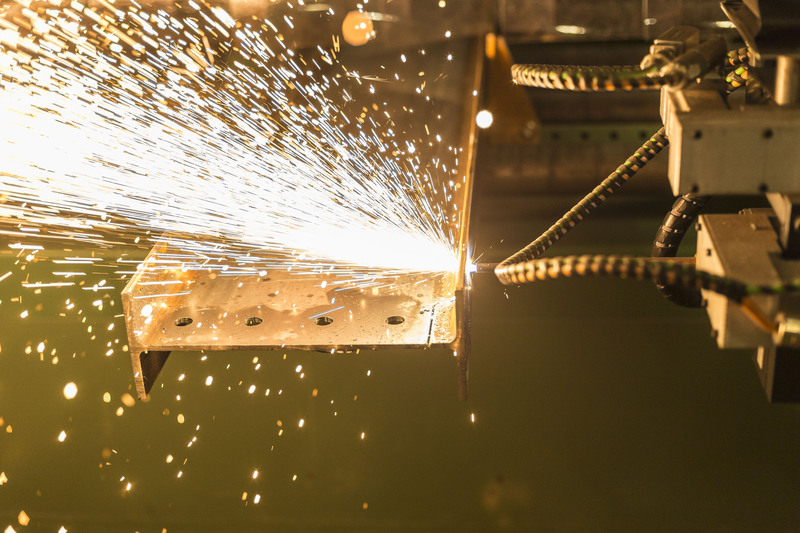 ft. expansion), a separate Stainless and Aluminum Fabrication Facility as well as a separate blasting facility, all filled with specialty equipment for almost any application, from forming to machining. View all of our shop equipment below and see what we can put to work for you today! One of the newest additions to our shop, with massive capability. Click here for more information. Working in tandem with the Peddinghaus Miter Saw and Drill line, this CAD based layout machine saves time down the line performing the necessary prep work, labelling and any layout marks necessary to complete even the largest jobs quickly and efficiently. From Glass to AR Plate, this machine has no trouble cutting everything in between cleanly and accurately. Take a look at the impressive capability it has to offer. Who ever said playing with RC cars as a kid wouldn’t come in handy later on was dead wrong. This remote controlled torch makes coping beams, channel or tubing a breeze. 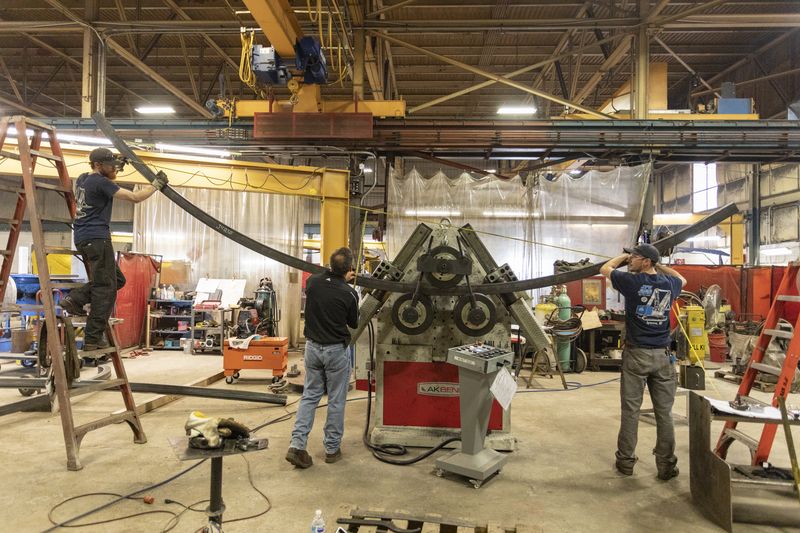 Connected by a system of conveyors to the Peddinghaus Miter Saw, Drill Line and Layout Machine, parts exit the setup through the Ocean Liberator and on to fabrication. With a work area large enough to handle a plate up to 14′ wide and 40′ long, our GDP+ burn table is our largest piece of fabrication in the shop. 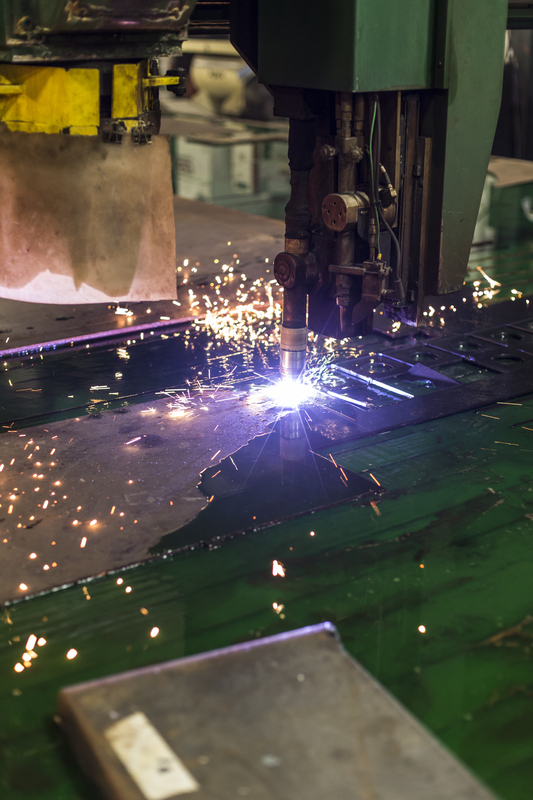 Plate as thick as 7″ can be processed by means of a 400amp plasma and oxyfuel cutting system. The GDP+ can also utilize a CAT50 spindle to handle any range of holes up to 3-1/2″ hole diameter through a 7″ thick plate. 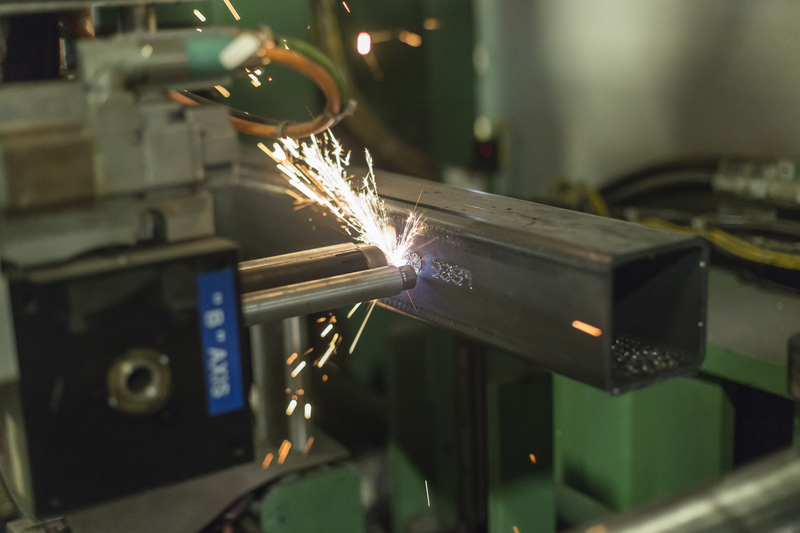 Between the CAT50 Drill Spindle and the high definition of the cutting torch, we can produce parts with AISC approved bolted hole connections. 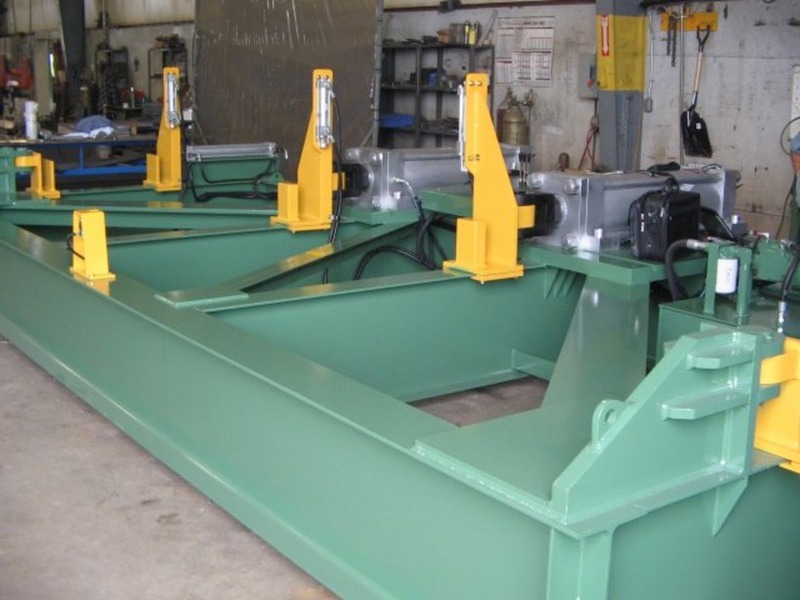 The BC 900 Cambering Machine can fulfill any cambering requirement from small commercial buildings to highway bridges, cambering beams at a fraction of the cost of mill or heat cambering. With 330 Tons of pressure it can cold camber up to a 36 x 210 A36 beam or a 36 x 150 Grade 50 beam. Bay-lynx cambering machines utilize two primary hydraulic cylinders spaced some distance apart. This distributes the bending over a certain length of the beam; thus, the strains from the direct pressure on the web and the bending are not concentrated at one spot as is the case when a single ram is used. This, along with special guides and supports, reduces the possibility of twisting and buckling. Weighing in at over 10,000lbs and using over 10 tons of hydraulic pressure, JPW’s new angle rolls, the APK – 121 can roll many different profiles of tubing, angle, channel, round bar and square bar. It’s most impressive capabilities are the ability to roll those materials “the hard way”. Take 3″ x 3″ square bar for example: The APK – 121 can roll this material into a radius as tight as 32″ “the hard way”. 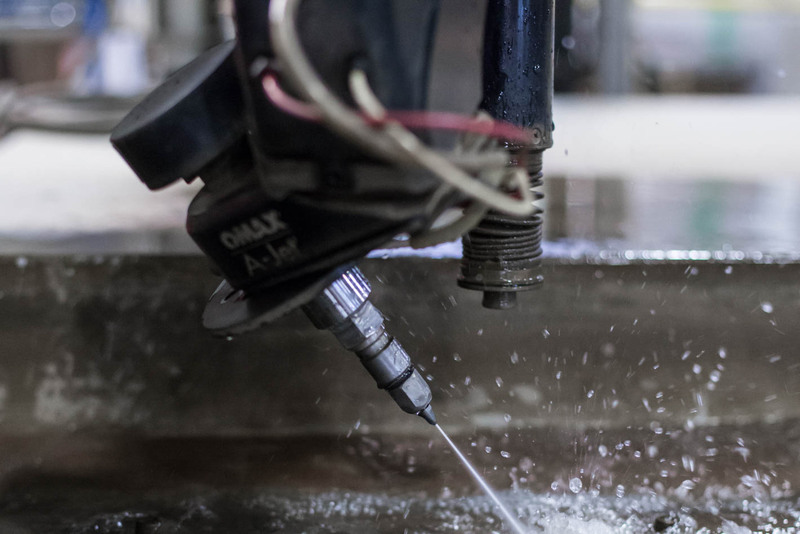 With a machine like this in our arsenal of fabrication equipment, we can create and fabricate more complex designs than ever.